Take on even the toughest terrain with this realistic 4×4 Crawler. Operate the 4-wheel steering and 4-wheel drive using the supplied LEGO Power Functions infrared remote control! Then ride the roughest rocks with the high-performance extreme suspension. motorized 4-wheel steering and 4-wheel drive, extreme suspension, opening doors and top section. Lego Power Functions infrared remote control! Take on even the toughest terrain with this realistic 4×4 Crawler. Operate the 4-wheel steering and 4-wheel drive using the supplied LEGO Power Functions infrared remote control! Then ride the roughest rocks with the high-performance extreme suspension. This heavy-duty model also features opening doors and top section. Rebuild it into a tough 4×4 off-road truck! 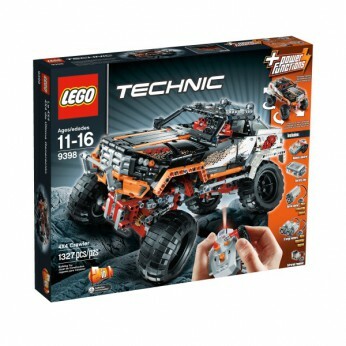 This toy costs approximately £134.99 (for the latest and best prices make sure you check our retailer list for the LEGO Technic 4X4 Crawler 9398 above). In our review of LEGO Technic 4X4 Crawler 9398 we classed it as being suitable for ages 6 years, 7 years, 8 years, 9 years, over 10 years but recommend you check the manufacturer specific advice before purchasing.